Interested in learning more about our work, participating in a study, or volunteering in the lab? Please feel free to contact us via email (maplelab.assistant@gmail.com) or phone (905.525.9140, ext 27021). Or, simply drop by the lab complex, which is located in room 422 of Togo Salmon Hall on McMaster’s main campus in Hamilton, Ontario. We periodically host open house events with summaries of recent research findings. If you need to contact Dr. Schutz directly, please visit his contact info page. 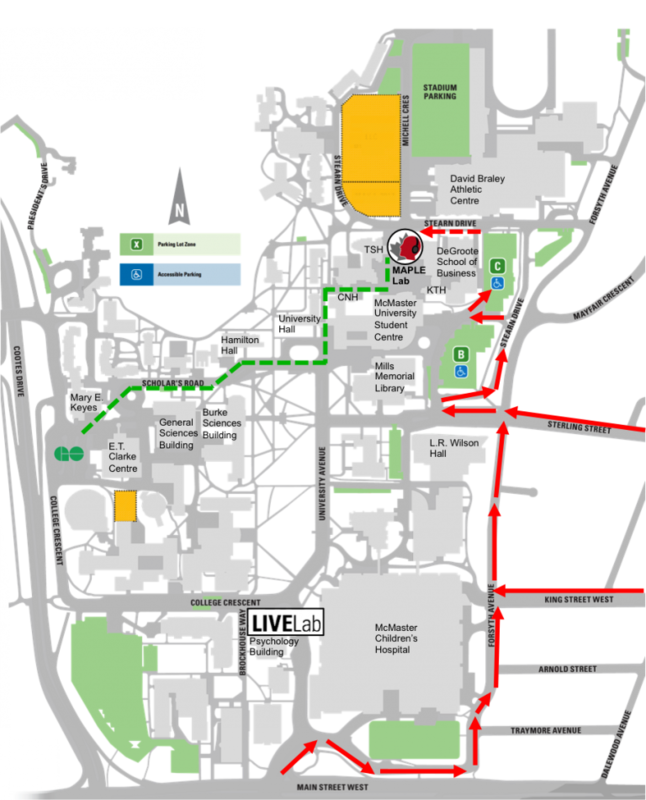 If you are traveling from Toronto or farther East, you can use the GO trains and bus routes to get directly onto campus. The Lakeshore West line travels from Union Station to Aldershot Station. This trip is approximately an hour long. On weekdays, the train leaves every half hour, with express lines opening up between 4pm-6:30pm. From Aldershot, there is a direct bus line onto campus grounds (bus 15). Follow the walking instructions below to reach Togo Salmon Hall from the bus loop. During weekends, while the Lakeshore West train runs regularly, the Aldershot-McMaster bus line 15 does not run. In these situations we recommend taking the alternate bus from Aldershot-to downtown Hamilton, and walking from the first stop at Columbia College. Always check with GO transit before making your trip as these schedules are subject to change. Take the path on the left (facing the large chimney) onto Scholar road. Travel straight until you see an archway on the left-hand side (where the road ends). Go through here and climb up the wide stairway on the right and walk until you’re in the middle of the courtyard. 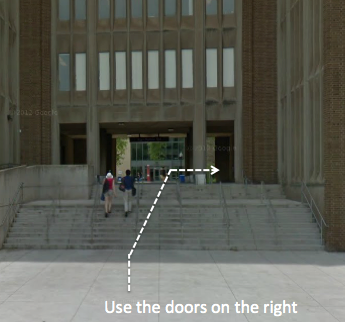 On your right should be sliding doors going into the Student Centre, and on your left should be Togo Salmon Hall. 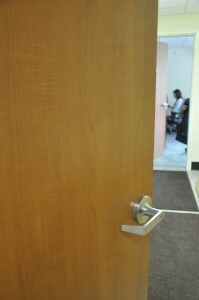 Enter the left-wing door and take the elevators up. If you are coming from off-campus by car, simply use the Google Map application below for door-to-door directions or follow the directions below using the map above for reference. Enter from the Emerson/Main Street intersection and turn right and follow the road around the McMaster Children’s Hospital. Continue down Forsyth Avenue then turn left at Sterling Avenue. Then follow the road to Parking Lot C (beside the DeGroote School of Business). After parking, walk along Stearn Drive and enter TSH using the doors in the right hand side and then simply take the elevator to the 4th floor, and follow the signs (we are on the right, after exiting the elevator). Travel west along Sterling Street (or King Street West and turn right onto Forsyth Avenue and then left onto Sterling Street) and then follow the road to Parking Lot C (beside the DeGroote School of Business. Visit Parking Services for additional information on parking at McMaster.